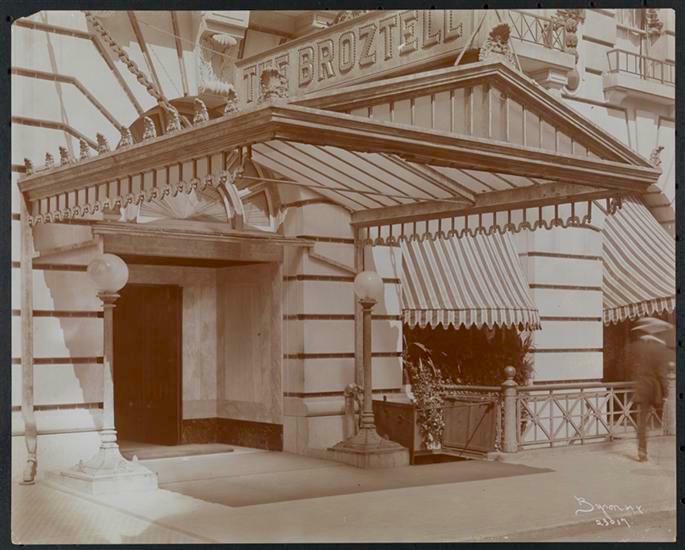 When it opened in 1905 at 7 East 27th Street, it was the Hotel Broztell: an elegant, 250-room Beaux Arts hotel with an entrance flanked by globe-like lamps and decorative touches on the limestone facade. After a renovation in 2014 (at right), the hotel was rechristened the Evelyn. 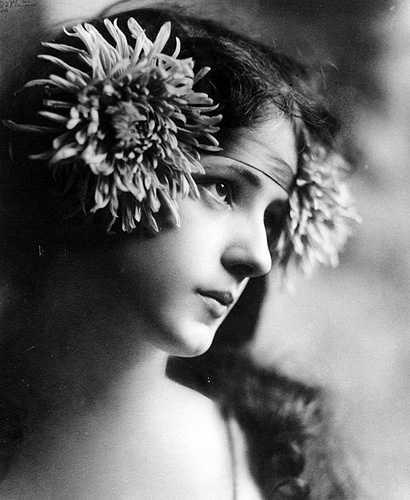 The new name pays homage to Evelyn Nesbit, one of the most famous beauties of the Gilded Age. Nesbit was a model and actress whose rise and fall in the city centered right here in this Madison Square Park neighborhood. Born near Pittsburgh in 1884, her father’s death left Nesbit’s family penniless. 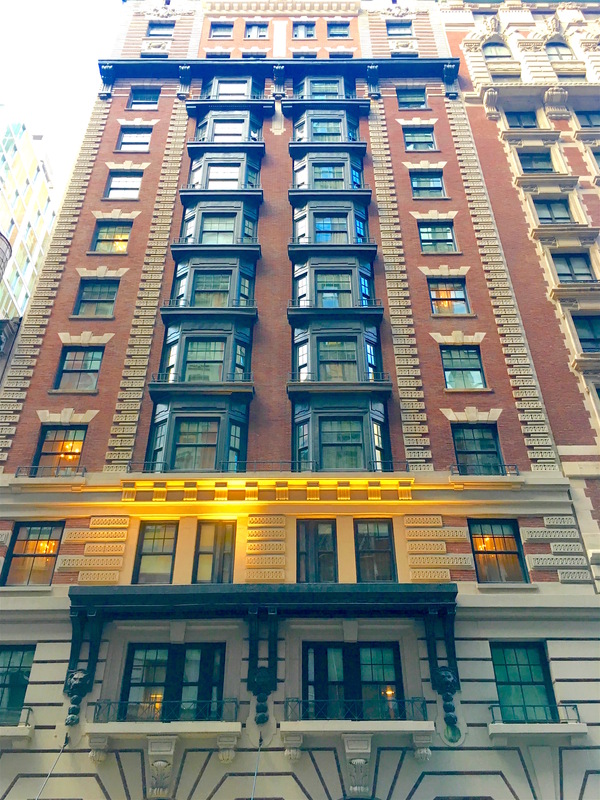 After many stops and starts she, her younger brother, and her mother moved to Manhattan in 1901, taking rooms on East 22nd Street. The teenager’s beauty caught the eye of artists and photographers. 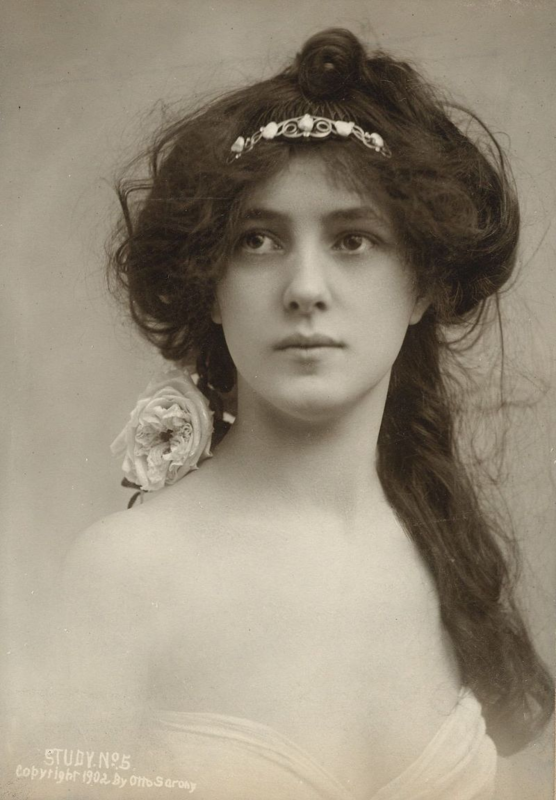 Soon Nesbit was a much sought-after model and chorus girl in the Broadway musical hit Florodora. She also caught the eye of architect Stanford White. “Stanny,” as he was called, was famous for the buildings he designed, many of which were in the East 20s. The middle-aged White was also famous for his interest in pretty young showgirls. He was introduced to Nesbit by another chorus girl, who brought her to the apartment he kept at 22 West 24th Street. Soon Nesbit was visiting White here on her own. At first, their relationship was more paternal, she later wrote. But after White encouraged her mother to leave town one weekend, he invited Nesbit over and subsequently drugged and raped her, she later alleged. 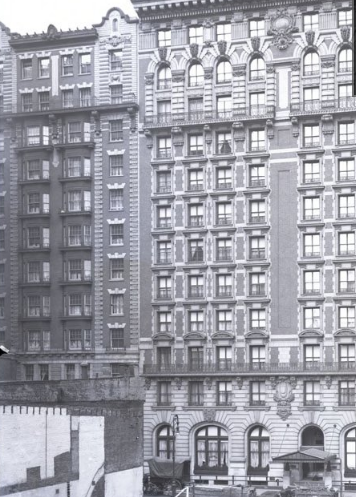 The Evelyn hotel is also just down the street from where Madison Square Garden once stood. Designed by White, this second incarnation of the Garden had a breezy rooftop that was popular with the city’s movers and shakers. It was here on the roof garden one warm night in June 1906 where Nesbit’s mentally ill and extremely jealous husband, Harry Thaw, approached White from behind and shot him dead. But how many guests know of the hotel’s namesake and that the events surrounding her fame and then scandal happened within five years right here in today’s Flatiron neighborhood? Cold rain and wet snow make it hard to get around New York on foot and take in its beauty. 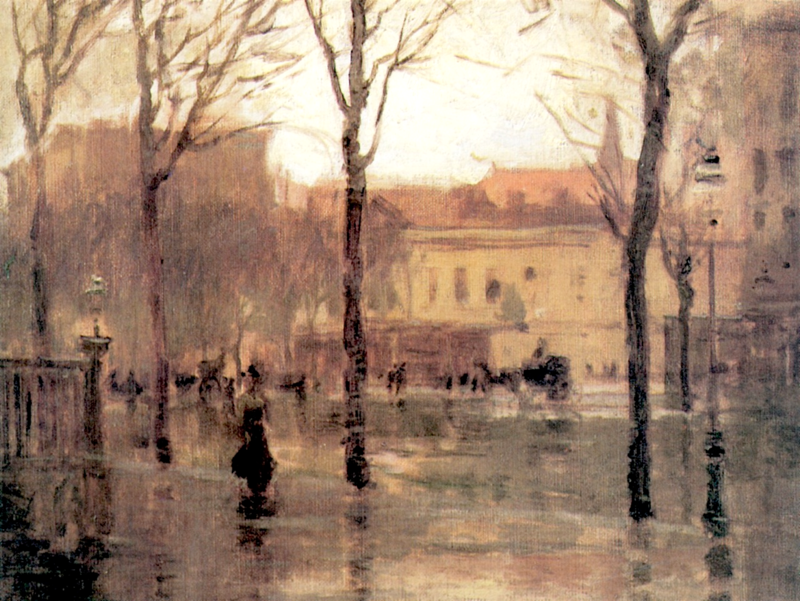 But damp weather like this was ideal for the Impressionist painters who lived and worked in the city at the turn of the last century. 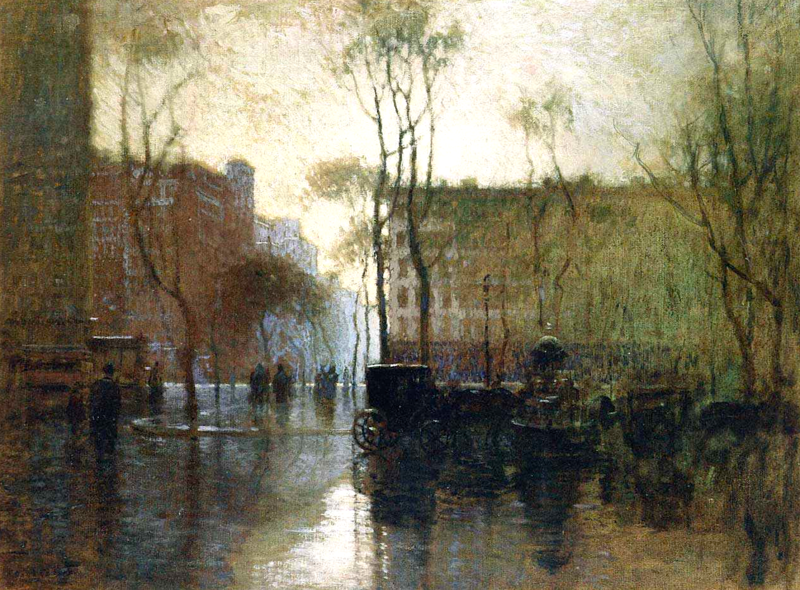 With dark streets marked by puddles and tree branches heavy with water, the Gilded Age city glistened. The blurred faces of New Yorkers in black coats and hats came across as elusive and mysterious. Carriages and street cars made their way through wet streets with passengers hidden and snug inside. Tall buildings higher than treetops and small walkup tenements alternate in the background. Few painters revel in this rainy enchantment quite like Paul Cornoyer. Born in St. Louis in 1864, he came to New York at the tail end of the Gilded Age in 1899. Cornoyer focused on Madison Square Park, at the time still a lovely spot in Manhattan but no longer than exclusive park of the city’s elite. 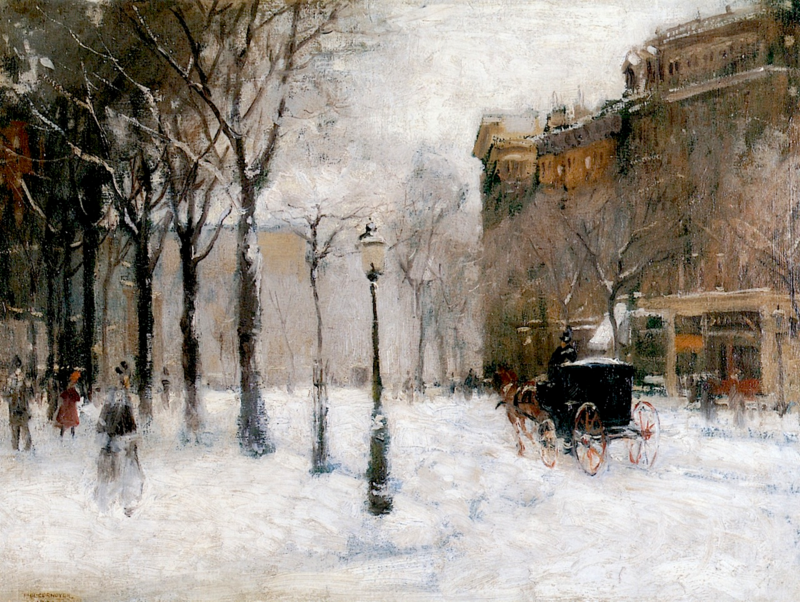 The Flatiron building and Madison Square Park can be seen in the background of many of his paintings. But he also visited other locations, like Columbus Circle, Central Park West (the site of the fourth painting above), Washington Square. 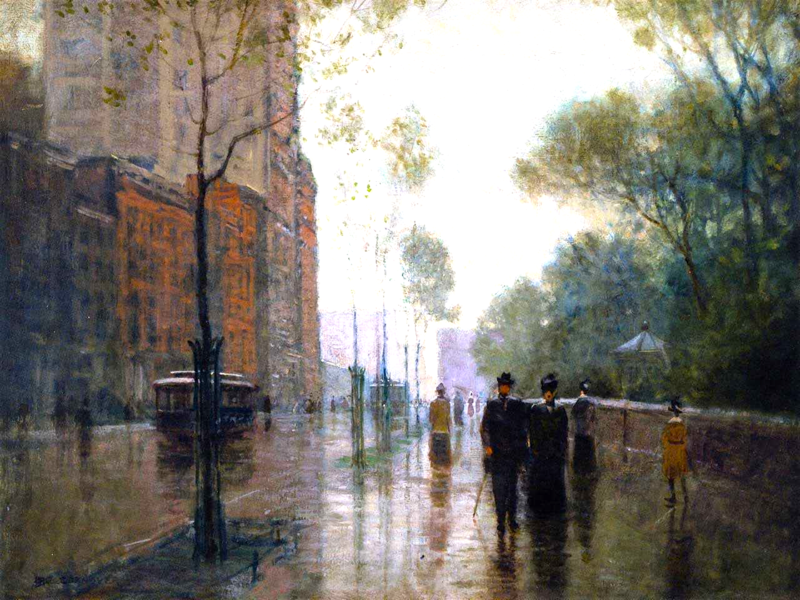 His depictions of these and other streets and parks present us an atmospheric Gotham with soft, dreamlike contours. To get a sense of modern, massive New York City, you have to look up and take in the scope of the bridges, apartment towers, and skyscrapers. But to uncover the city’s past, it helps to look down. That’s where you’ll find manhole covers not stamped “Con Edison” or “Made in India” but embossed with a local manufacturer’s name and signature design motif. Instead of cookie cutter lids that all look alike, these covers turn a utilitarian object into something sublime. One of my favorites is the one at the top of the page by J.B. and J.M. Cornell, a manufacturer of specialty and ornamental ironwork since 1828, according to glassian.com. 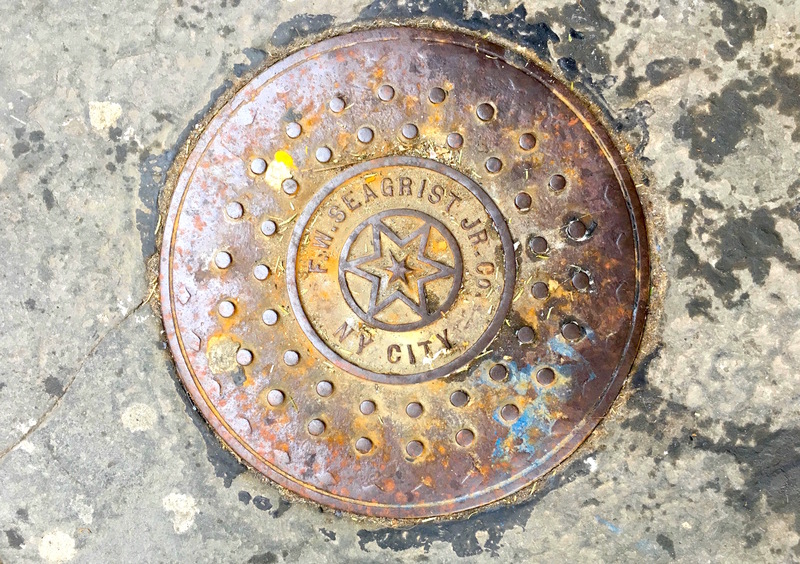 The address on the cover is that of the company; the cover itself was spotted in Brooklyn Heights. (Patented 1845!) The cover likely had glass over the holes at one time, allowing light through. I love the large center stars the F.W. Seagrist Jr. company put on the iron lid in the second image, found on East 18th Street. According to fellow manhole cover fan Walter Grutchfield, the company was founded in the 1870s and went out of business in the 1920s, he wrote. 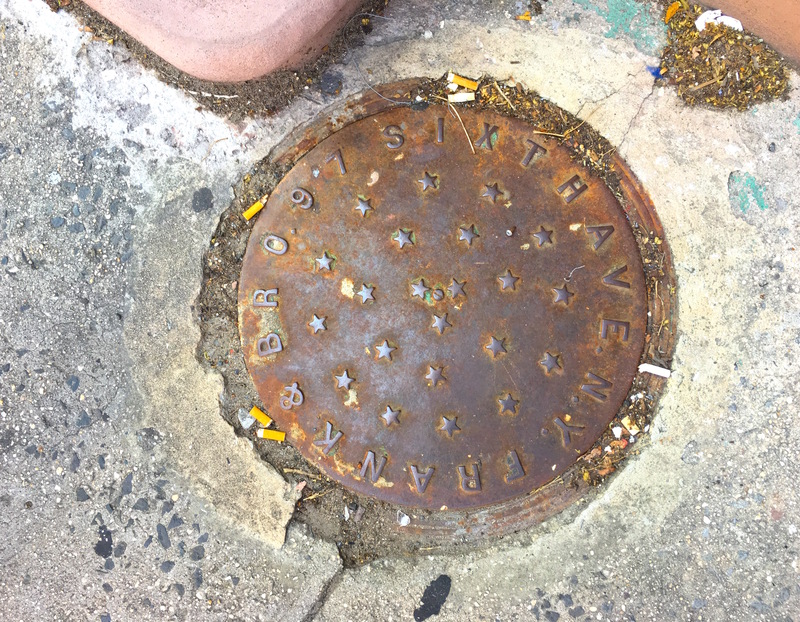 Stars were apparently a popular decorative element at the turn of the century, when these covers were installed. Here’s another cover from Frank & Bro, located on Sixth Avenue in Tribeca. Grutchfield again has the backstory on these brothers, Max and David, and their hardware business that existed from 1888 to 1955. This cover appears to be so deeply embedded in cement, it’s possible it was installed before the 20th century. 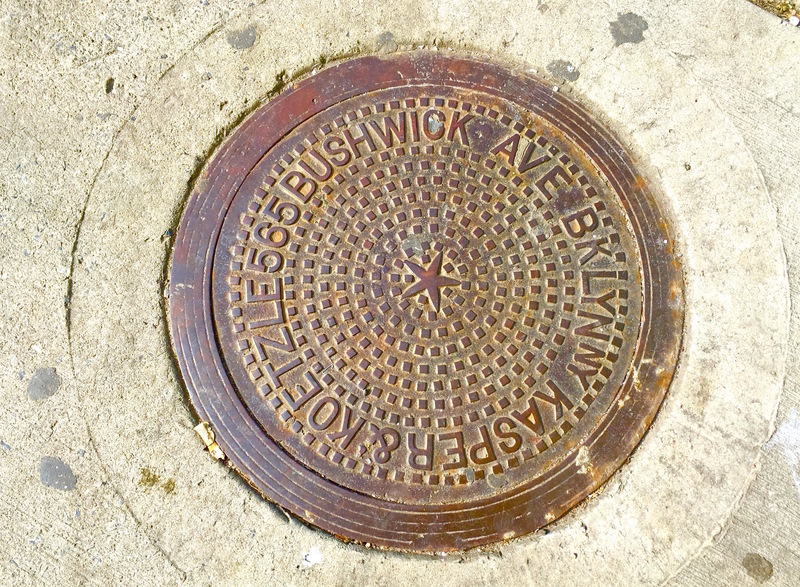 This cover, from a hardware firm called Kasper and Koetzle, is part of a sidewalk in Greenpoint. The company operated from a store on Bushwick Avenue; they manufactured “heavy hardware” and began 12 years ago, according to this guide from 1914. 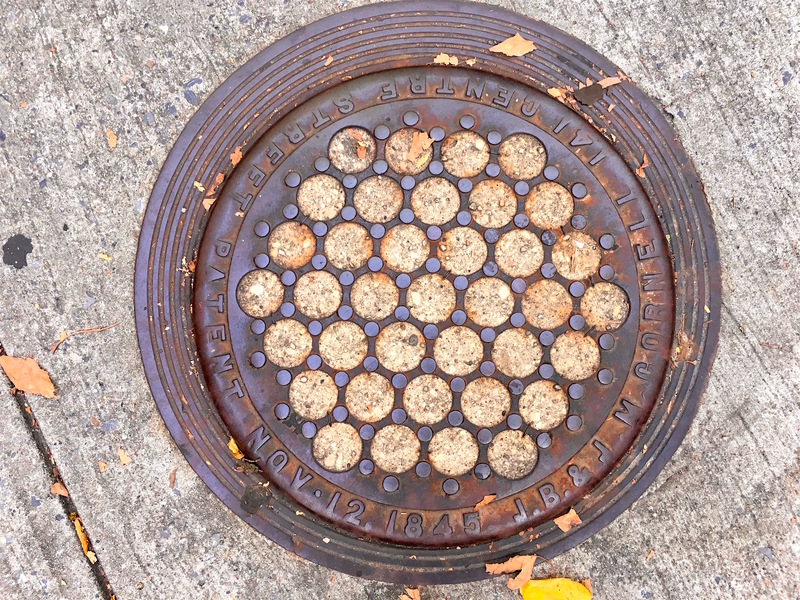 I’s a thrill to come across one of these rare Croton Water covers, which pay homage to the aqueduct built in 1842 that supplied the city with fresh, clean upstate water. This lid was found in the 150s near Trinity Church in Washington Heights. (DPW: Department of Public Works.) 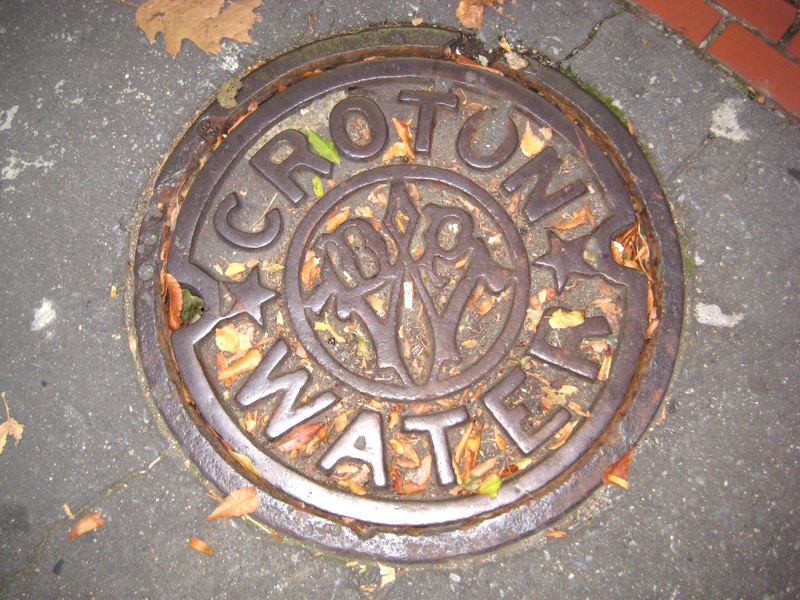 Some of the Croton Water covers have dates on them, but unfortunately this one does not. More city manhole and coal chute lids can be found here. When the Flatiron Building opened in 1902, this graceful steel-frame skyscraper was a symbol of 20th century urban power and progress. 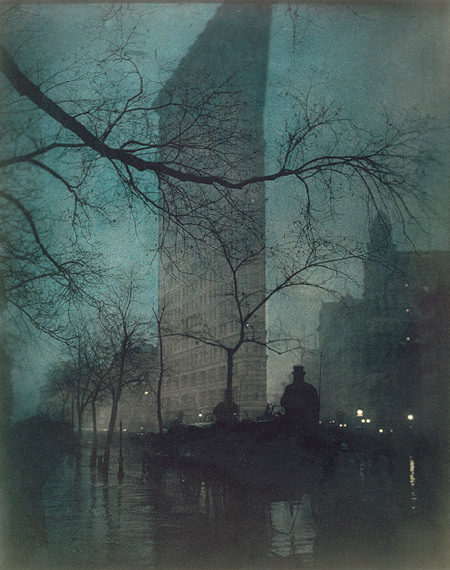 Two years later, pioneering photographer Edward Steichen created this photo of the Flatiron. He gave the image a blue glow during printing to make it evocative of twilight. And with the tree branches and puddles of rain in the foreground, he juxtaposed the made-made tower with powerful elements of the natural world. “Steichen may have been drawing on his knowledge of Japanese prints, in which similar natural and built features exist harmoniously,” states this Middlebury College Museum of Art page. Japanese woodblock prints were all the rage at the time. Ever notice that the area in front of the Flatiron Building—that triangular juncture where 23rd Street, Fifth Avenue, and Broadway meet, is kind of a windy spot? This painting, “Dust Storm, Fifth Avenue,” is Sloan’s interpretation of that day. 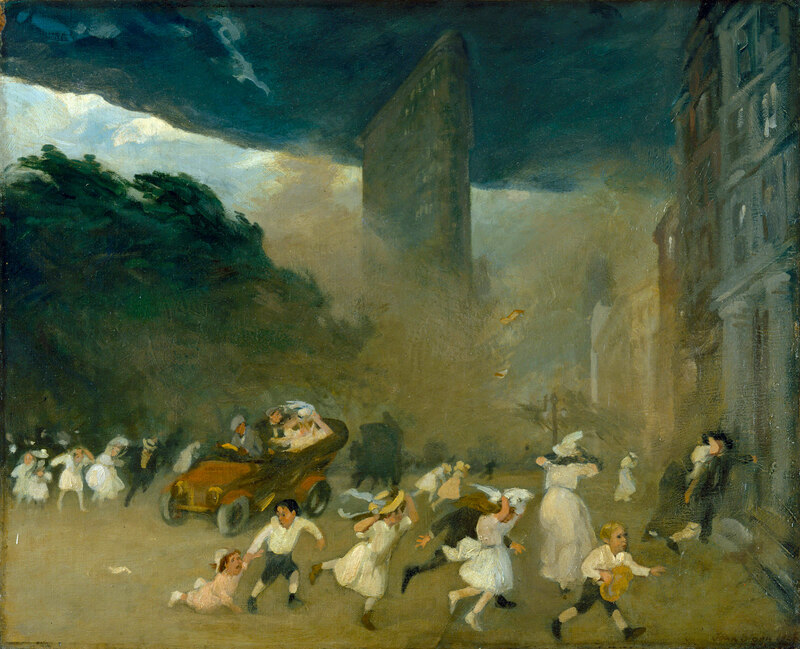 It “captures the mayhem of that afternoon, in which the Flatiron Building itself—the only skyscraper in a low-rise neighborhood—created the wind tunnel effect depicted by Sloan,” states the Metropolitan Museum of Art, where the painting resides today. 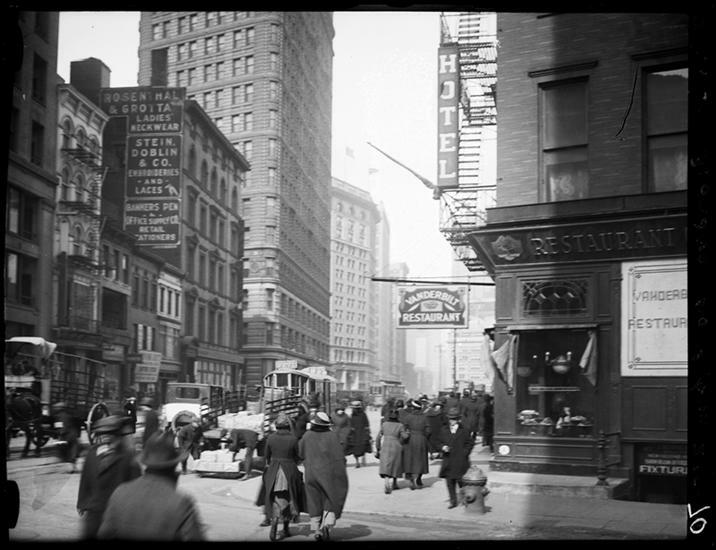 The windy effect on 23rd Street was the subject of a 1901 film clip and then another from 1903, the latter placing the camera at the foot of the Flatiron and capturing hats and skirts blowing in the gusts. The upside of new construction is that old bits and pieces of the city come back into view. 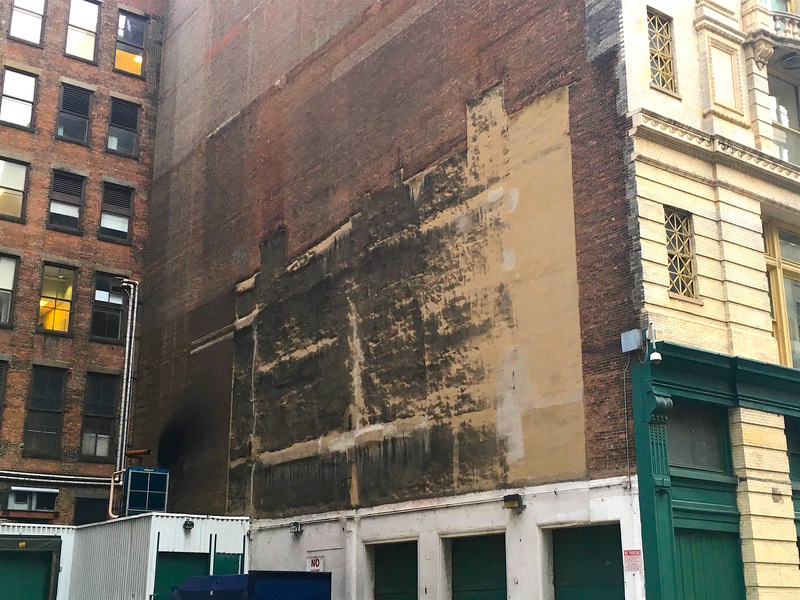 At 1165 Broadway, a landmarked 1867 building (below, in 1900) currently being transformed into coop, a shadowy color sign has reappeared. 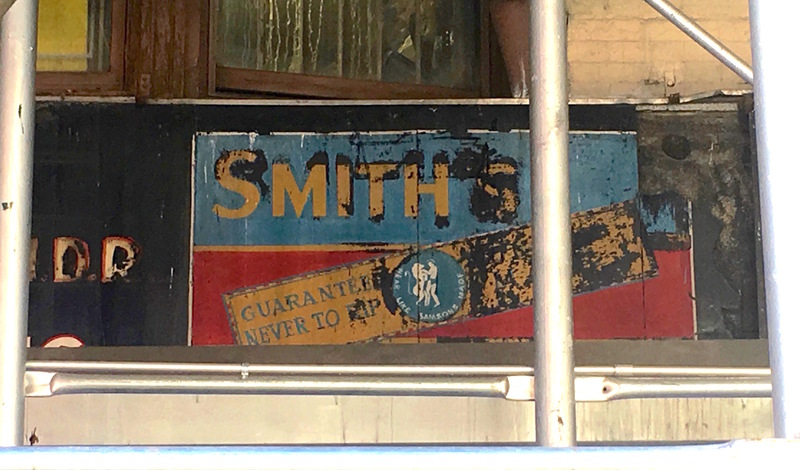 “Smith’s” the sign says. The logo next to it reads “Guaranteed never to rip” and includes an image of the biblical Samson and a lion. A smaller tagline reads “wear like Samsons . . . made?” That fourth word is hard to figure out. So what was Smith’s selling? The phrase “guaranteed never to rip” was used in ads for cheap suits decades ago. But the mention of Samson, known not for cheap suits but his ability to rip a lion in half, makes this ad a mystery. The weather is still chilly and skies are wintry gray. 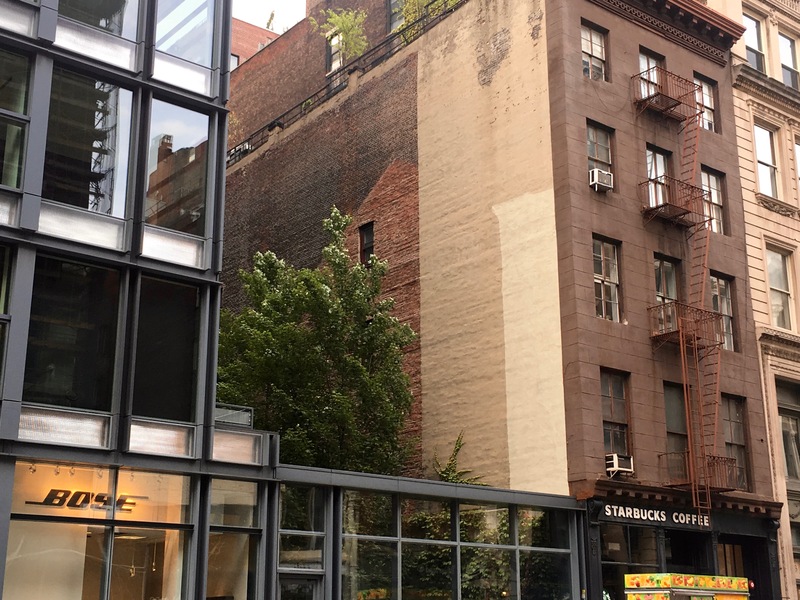 But on the facade of a building on East 30th Street, pretty white daisies have been popping up for at least a century. 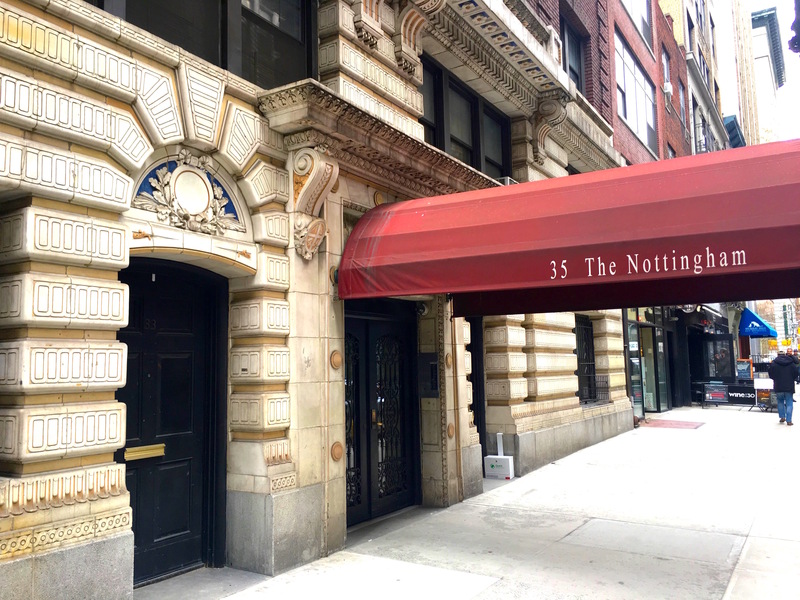 You can see them on the underside of The Nottingham, a handsome apartment residence designed by Stanford White that has kind of a Byzantine or Tuscan look to it. 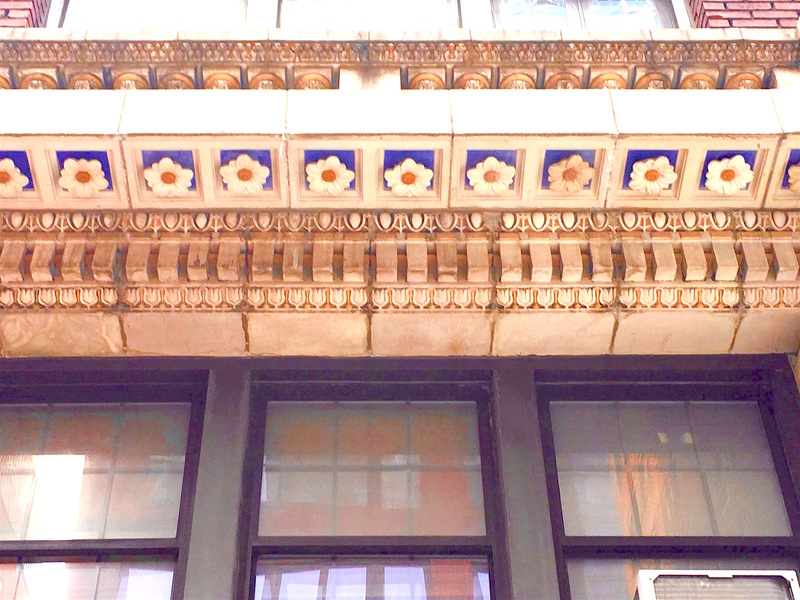 Bright white daisies with yellow centers surrounded by blue tiles appear under a second-floor juliet balcony. When The Nottingham was built is a bit of a mystery. Real estate website say the late 19th century; an article on reinforced concrete from 1907 implies the early 1900s. Did Stanford White have a hand in adding the daisies? It could be the kind of ornamental whimsy he enjoyed. It may not have been the poshest hotel in the 19th century city. 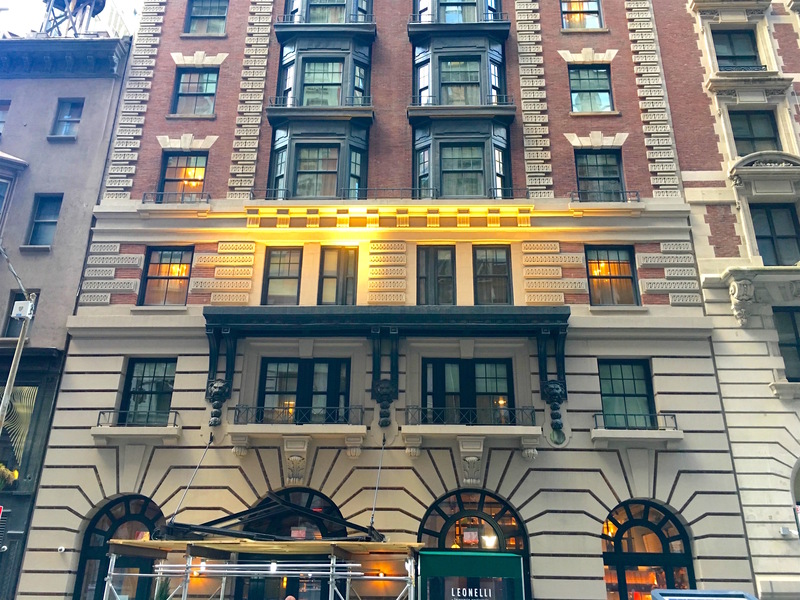 That honor could be bestowed on the nearby Fifth Avenue Hotel at Fifth Avenue and 23rd Street, where politicians and power brokers wined and dined. 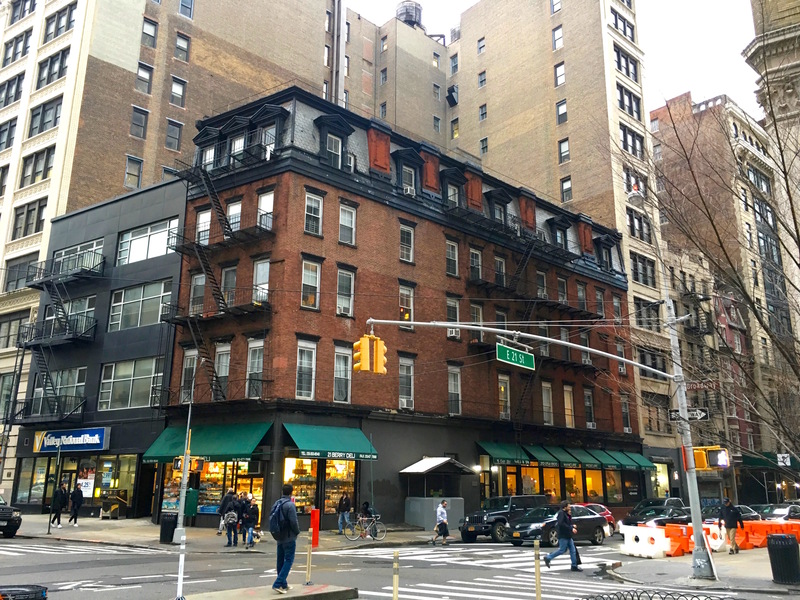 But Bancroft House, the hotel that occupied the upper floors of the circa-1857 building that still exists at 922 Broadway, filled a niche. 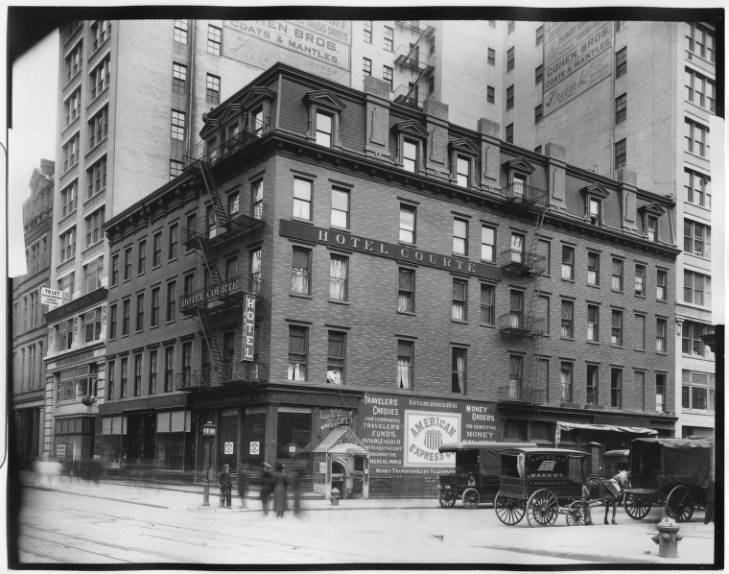 The hotel, on the stretch of Broadway that would soon be known as Ladies Mile near fashionable Madison Square, billed itself as accommodations for “gentlemen” who desired “clean rooms and quiet night’s rest,” according to one 1894 ad in The World. The price per night for cleanliness and rest: 50 to 75 cents, with weekly rates starting at $3. 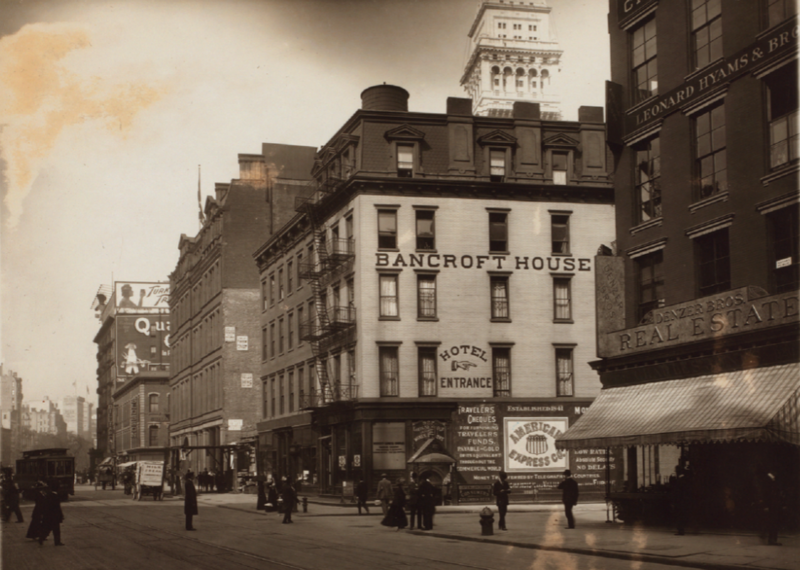 Like any hotel, the Bancroft—with its enchanting slate mansard roof and rows of chimneys—has its darker stories. Newspaper archives cite suicides and a grisly 1887 murder-suicide, with a young porter stabbed to death by a guest, who then shot himself in the head. 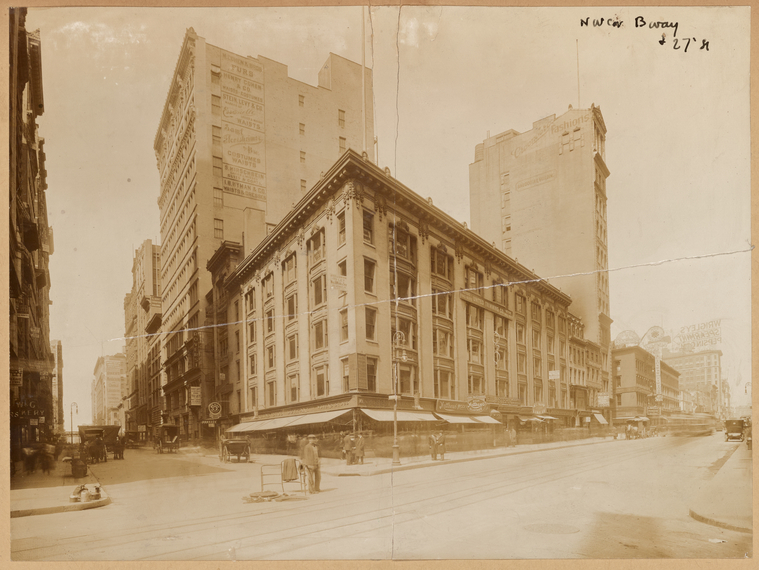 By 1920, with Madison Square a lot less stylish, the Bancroft became the Hotel Courte. The American Express office on the ground floor remained, but not for long. The third photo above shows that it’s been replaced by a restaurant. Today the lovely building with the mansard roof houses a deli and is described as a “boutique building” on Streeteasy. The rent for one recent one bedroom: $3495 per month. New York is a haunted city. Everywhere you look are the phantoms and ghosts of old buildings that may have been torn down but never truly disappeared, leaving their faded outlines etched into the cityscape. 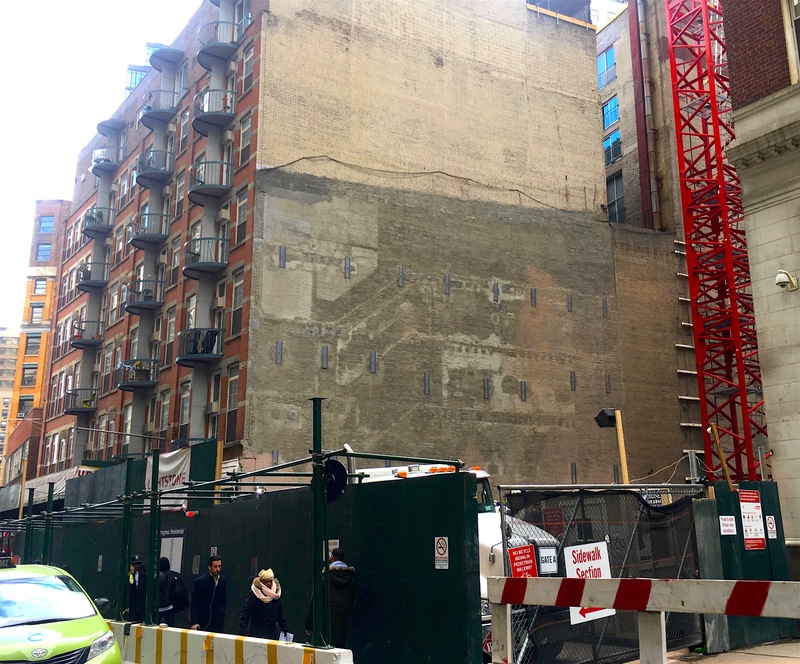 Between the time they meet the bulldozer and a replacement building goes up, these ghosts are visible—remnants of older versions of New York and the nameless people who lived and worked there. 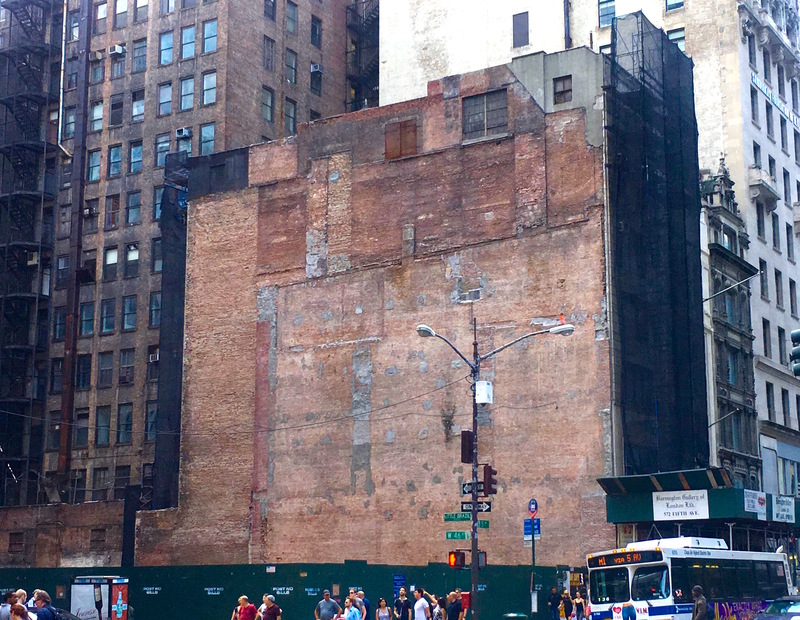 The photo at the top, at Fifth Avenue and 46th Street, reveals the outlines of a couple of different buildings. I see a tenement-style structure with three or four floors and two slender chimneys. Then there’s another building with a slope in the front. 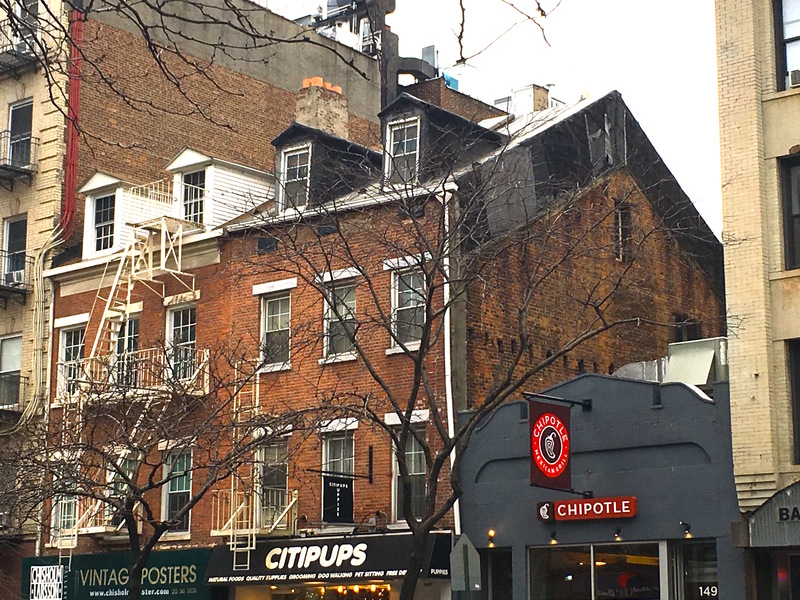 On Eighth Avenue in Chelsea (below), two twin Federal–style homes from the early 1800s still stand. A third smaller house is just a faded outline of a pitched roof. On Fulton Street is the imprint of a squat low-rise and the staircase that countless New Yorkers trudged up and down over the years. Here’s the remains of a tenement in Flatiron. How many people lived their lives in this little building with the two chimneys? Another pitched roof, a remnant of an era when they were fashionable (or simply practical). This one is on Broadway and Grand Street. 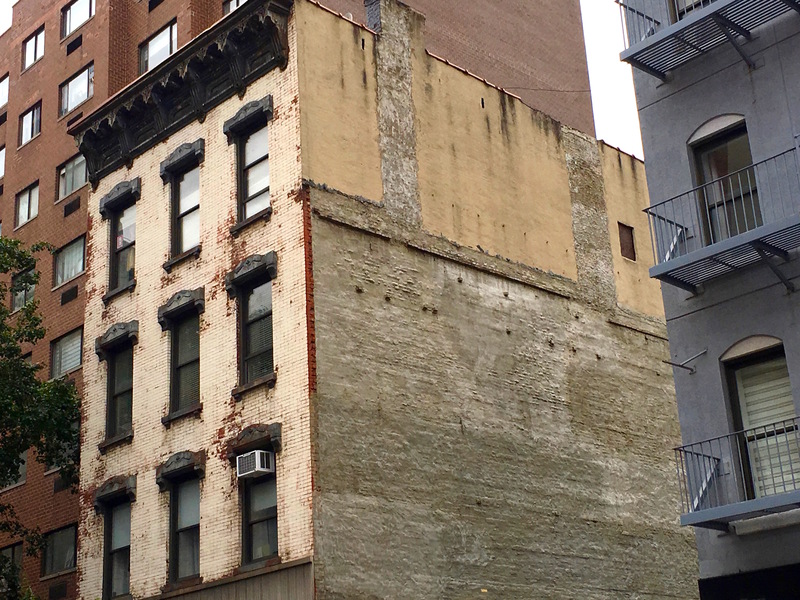 Against the side of a classic 19th century tenement is a short blocky building, near Penn Station. 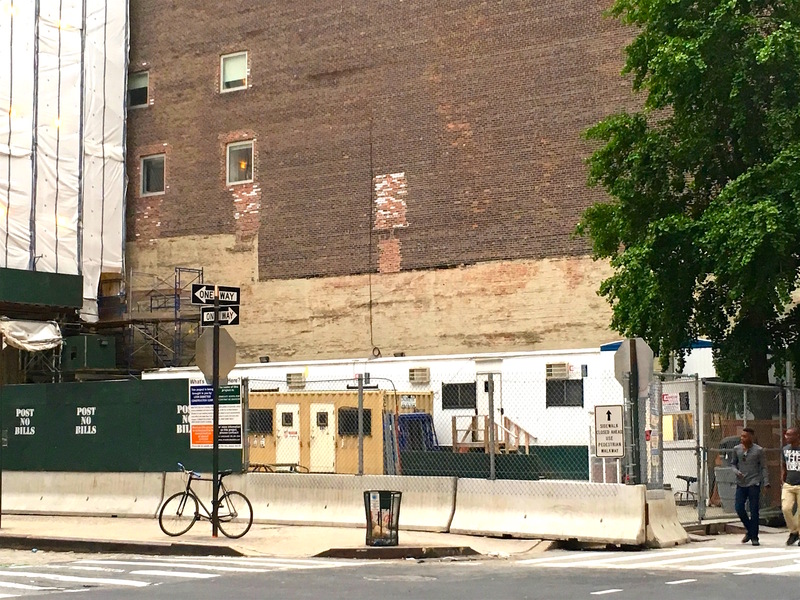 On a corner in the far West Village is the outline of a building so long and low, I wonder if it could have been a stable. 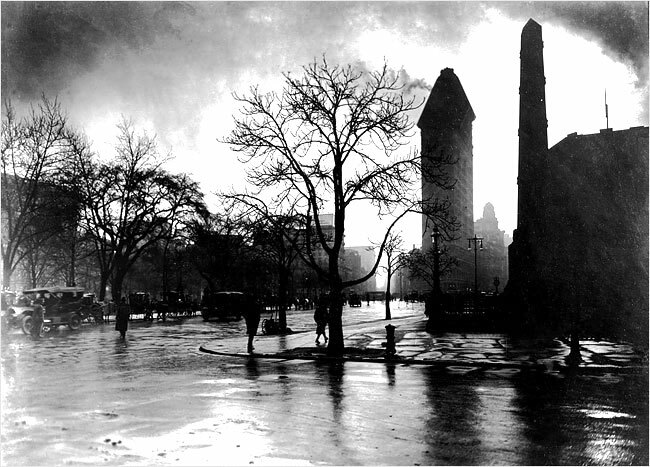 Jessie Tarbox Beals captured this image of a wet winter day in Madison Square, with cars stacked up on the side of the park on the left and the Worth monument and Flatiron building (a mere 18 years old!) on the right. Tarbox Beals is best known as a pioneering female photographer who won fame for her intimate images of Greenwich Village in the 1910s and 1920s—only to struggle to make a living after the Depression and dying penniless at Bellevue in 1942.